Located in the Paradise District, V-Grits Food Co. and False Idol Independent Brewers have joined forces to bring a vegan brewpub to Louisville. Our passions - food, craft beer, overall health and wellness, animal welfare, sustainability - make V-Grits and False Idol a mission-driven partnership. 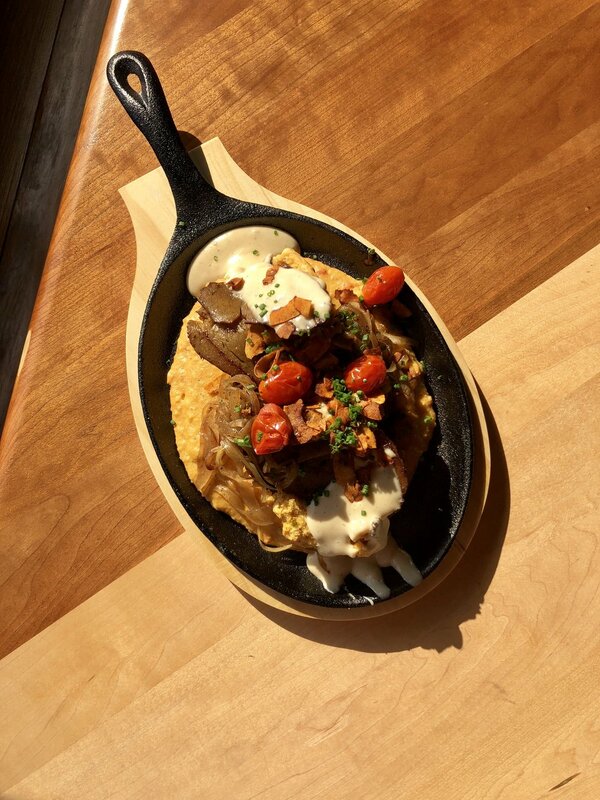 V-Grits brings years of food truck experience, serving southern-style vegan comfort food to Louisvillians, and winning the best food truck in the city in 2017, and 1st runner up in 2018. We are committed to making every ingredient from scratch, including all of the vegan meats and cheeses. Let us prove that you can still enjoy flavorful comfort food without animal products. Please use us a resource for your own food journey. We will patiently answer and help with any dilemma you may face, from wondering where your protein will come from, to attending family barbecues. We’ll always strive to give it 100% - so that your experience with V-Grits and False Idol is a fun, delicious adventure. Curly kale massaged in a citrus vinaigrette, with pickled carrots, red bell pepper, candied apples, pecans, fried shallots, plant parm. Romaine, cherry tomatoes, diced red onion, banana peppers, kalamata olives, vegan feta, greek dressing, croutons, fresh mint. Vegan gyro meat, greens, cherry tomatoes, diced red onion, banana peppers, kalamata olives, vegan feta, greek dressing, croutons, fresh mint, wrapped in a flour tortilla. Vegan turkey, spinach pesto, greens, tomato, pickled red onion, wrapped in a flour tortilla . Vegan fish (eggplant), greens, banana peppers, vegan tartar sauce, on multigrain bread. vegan ham in a citrus bahn mi glaze, greens, pickled carrots and daikon radish, jalapeno, spicy mint mayo, cilantro, on a baguette. German, unfiltered Pilsner. Balanced and drinkable, with a spicy nose and crisp finish. Tart ale with a malty, pie-crust finish. Bright, citrus aroma from dry-hopping, minimal bitterness.